Congratulations on your 10th anniversary. That is amazing. Happy Birthday to you as well. Wonderful poem and sweet tea cup. What a lovely poem and the tea cup is so pretty! Have a wonderful week! Happy belated birthday, and a happy 10th anniversary to you. I'm celebrating my birthday today, it will be in a blizzard, but should be fun nonetheless. This reminds me of my Grandma's poems. Very nice! Celestina Marie, Love filled poem. Your words have so much meaning. Touched my heart! Good afternoon Celestina, I am so sorry I missed your birthday last week, so I would like to send you belated birthday greetings. I so enjoyed your poem and your teacup and saucer is beautiful. What a lovely poem and teacup!! Congratulations on 10 years!! Celeste, such a gorgeous teacup, I actually gasped it took my breath away no lie. What a beautiful poem-you really created a serene pretty picture in my mind. The teacup is as almost as beautiful as your poetry. Happy 10 years, dear Celeste! Wishing you at least 10 more! Celestina~ Good Morning to you and many blessings for your day. How tender and beautifully written is your poem and my, that is a gorgeous tea cup! Today we are getting hit with a snow storm and it is just beautiful. It is one of those quick accumulating snow falls. I shall enjoy my walk with Donatella this afternoon as she plays in the snow. And, I love that teacup. Lovely poem. I have a friend who makes tea a daily event, and has a tea party once a month! Beautiful poem to celebrate a cherished tea cup. Happy 10 years! Sweet, sweet poem. Oh - and the cup and saucer? To die for! Happy spring and sunshine today! Beautiful poem...beautiful tea cup...congrats Celeste! Nice to go back in time with your fav posts! Happy belated birthday dearest Celeste! So many great things to celebrate, and I believe this would be my 10th year too. Enjoy all the love! What a beautiful teacup and a lovely, lovely poem. Delightful post! What a wonderful poem you wrote dear.. The caul and the poem are lovely like you.. big hug.. I am so glad that you shared this lovely poem once again, it is surely worth another share, such sweet and precious words, written perfectly. Wishing you a fabulous week to come! Such a pretty teacup! Thank you for sharing it again. Enjoy your week! Hi Celeste, my dear friend, thank you for sharing this wonderful poem again! It really is so wonderful! Wow 10 years Celeste, congrats! Your poem is delightful and seeing an old post that was new to me was fun. Congratulations on your 10th anniversary. You've created such a lovely space here, a true haven. Glad you had a wonderful birthday and congrats on the 10 year blog anniversary. WOW! That is amazing. The poem is beautiful. Happy New Week. 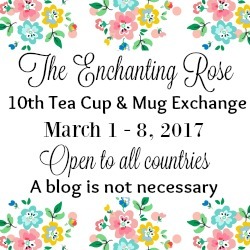 Sweet friend, what a beautiful post and oh, what a stunning tea cup! The detail is exquisite. I agree with Amalia, you have created a beautiful space here. Your words and creations touch the hearts of many. Hugs to you! Happy belated birthday, Celeste! God has blessed you with so many gifts. An artist, a writer/poet, an eye for everything beautiful. It goes along with the beautiful face we see in your welcome to us who visit. : ) Thank you for blog. It's an inspiration. Beautiful teacup, and poem. I, too had a birthday last week, on the 3rd. Guess we are both Pisces. :) Hope you have a lovely week! Check your email for a 'thank-you' from me. OMG, what a wonderful giveaway to win!! So blessed! Ten years? Congratulations, that's an accomplishment! And happy belated birthday to you. Here's to you that your dreams may always come true. Happy Blogiversary! A beautiful poem Celeste! I am so glad you are sharing past posts because its a second opportunity for a wonderful read. May I also wish you a belated Happy Birthday and happy blogging milestone. Also, thank you so very much for your warm and heartfelt comments. I wanted to let you know that I am nearing the end of my college experience and am currently doing a 7-week internship at a museum as a requirement for graduation. It is an interesting experience to be sure. I must admit that I am struggling to try and manage my time and make sure my family's needs are met. Sadly, this leaves little time left for visiting my favorite people in the world and their fabulous blogs. I hope you'll have patience with me. Thankfully, this time won't last forever and I will soon, once again, be able to see all the wonderful things you are doing. Happy belated Birthday to such a talented and inspiring woman. You bring so much goodness, kindness, as well as genuine and heartfelt joy to our online community. Each of your hand-painted pieces are constructed and made with thoughtful and tender care and your poem today is an extension of your talent and inner goodness. Wishing you the best that this year has to offer!